Jessica Lynch was born on April 26, 1983, in Palestine, West Virginia. She enlisted in the U.S. Army and began basic training on September 19, 2001, at Fort Jackson, South Carolina. After training as a unit-supply specialist at Fort Lee, Virginia, Lynch was assigned to the 507th Maintenance Company at Fort Bliss, Texas, in March 2002. The 507th was sent to Southwest Asia in support of Operation Iraqi Freedom in early March 2003, and PFC Lynch was captured when a convoy she was riding in was ambushed by Iraqi forces on March 23, 2003. She was held as a Prisoner of War until April 1, 2003, when U.S. Special Operations Forces rescued her from an Iraqi hospital where she was being treated for her injuries. 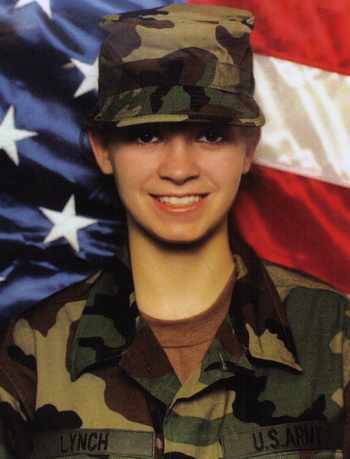 PFC Lynch was given a medical honorable discharge from the Army on August 27, 2003. 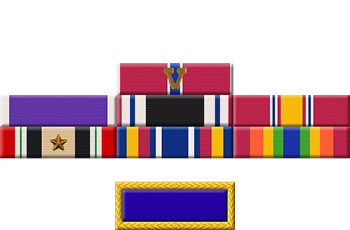 For exemplary courage under fire during combat operations to liberate Iraq, in support of Operation Iraqi Freedom. Private First Class Lynch's bravery and heart persevered while surviving the ambush and captivity in An Nasiriya. Private First Class Lynch's belief in the battalion's motto "One Team, One Fight" is in keeping with the finest traditions of military service. Her honor, courage and dedication reflect great credit upon herself, 507th Maintenance Company, 3d Infantry Division, Victory Corps, and the United States Army.